Little known fact about me: I actually met my husband at Jamba Juice. True story. Although I'm sure you are all burning to know all of the super romantic details that could have only followed someone meeting their eternal companion at a smoothie place, I will save that for another time and just let you know that I have a lot of experience with Jamba Juice. I know their products well. I was also excited when Jamba Juice sent me a Strawberries Wild and Caribbean Passion frozen smoothie mix to try for myself. I am going to be honest - the Caribbean Passion, while good, was not 100% like the store. I have come to conclude it's because you add apple juice to blend it up at home, but apple juice isn't found in the Caribbean Passion at the store. Still - it tastes really good. The quality of fruit Jamba Juice uses cannot be beat - it was delicious. The Strawberries Wild, however, did taste just like the store. It was really easy to make and convenient as well. 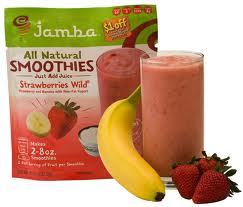 Do you want to win your own Jamba Juice at home smoothie? 10 lucky readers will each win one free at home smoothie of their choice! That's right....10 WINNERS!! TO ENTER: Leave a comment letting me know which flavor looks delicious to you! This giveaway will end at 11:59 PM (Mountain Daylight Time) on December 6, 2011. Congrats to Bridget, Bleush, EmeraldandJude, Sweepyhead, Stephanie, n8sense, Beth, BBrittBratt1398, DD, and Valerie won this giveaway! Mango a go go, and Caribbean Passion! mmmmm yum! Mango a go go, and Caribbean Passion!! The Caribbean Passion looks yummy! 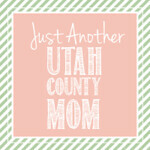 I like Utah County Mom on Facebook user name Lantana H.
They all look delicious. I would choose the Strawberry Wild. I would like the caribean passion. I follow you on GFC! The Razzmatazz sounds yummy! Strawberries would really be my favorite. My favorite is mango a gogo and I do pack it in my freezer! GFC brittney house and I would love to try strawberries wild flavor. You love juices...check this out!